Crash Forensics has the capabilities of performing complete testing of any automotive braking system including hydraulic, air, electric, vacuum, and serge. 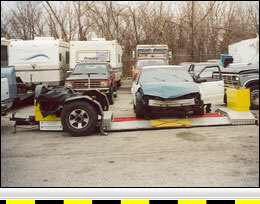 Our brake testing will identify both catastrophic failures and brake deficiencies. We are sensitive to concerns that the vehicle's post-crash condition could be altered during testing. Therefore, our testing is structured in a way that allows us to obtain results without altering the condition of the suspect system. Learn more about airbrake testing or our automotive brake expert. 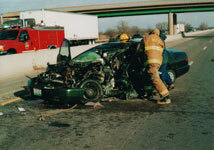 What is not well understood about brake failures is that true catastrophic brake failures are rare. Brake systems on modern vehicles are required to have various fail-safe mechanisms that reduce the likelihood of complete failure. Generally speaking, vehicles have two separate braking systems, whereby, in the event of a component failure, only part of the vehicle's brake system will fail to operate (partial failure). This allows the driver to stop, but requires a greater distance to do so in a panic situation. More commonly, braking deficiencies are what affects braking performance. Braking deficiencies are things such as oil-contaminated brakes, misadjusted brakes, misaligned brake linings, sticking brake calipers etc. Vehicles with braking deficiencies, in most cases, will still have the ability to stop, but will also require longer distances. 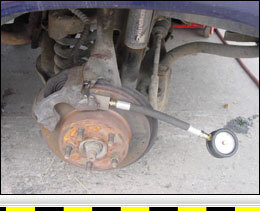 Under normal stopping situations, a vehicle with a partial failure or braking deficiencies may develop sufficient braking. However, when a vehicle in this condition is placed in a high-demand panic situation, it will not be able to slow or stop as quickly as the driver expects. 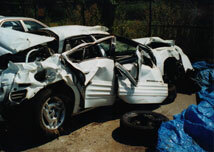 This failure to supply the demanded braking is often perceived by the driver as a catastrophic failure. When a true catastrophic failure of a brake system does occur, it is most commonly associated with some type of brake fade. Brake fade can be broken down into four main categories including: friction fade, mechanical fade, fluid fade, and domino fade. To best understand the causes of each type of brake fade, we will first discuss basic brake theory. The basic principle of how brakes work is the same for most vehicles. This principle is the Conservation of Energy, which tells us that energy is neither created nor destroyed, but can only be converted from one form to another. Brakes are energy converters; they convert kinetic energy (motion) into heat energy through friction between either a brake lining and brake drum surface or a brake lining and brake rotor surface (friction surface). The amount of heat produced by a brake system is directly related to the mass (weight) of a vehicle and the driver's desired velocity (speed) reduction. Heat energy is generally measured in British Thermal Units (BTU's), and the amount of BTU's produced by the brake system is the result of the amount of kinetic energy that is being converted. Since Kinetic Energy = ½ m · V² (kinetic energy equals one half mass times velocity squared) the amount of energy that the brake must convert to heat is doubled by doubling a vehicle's weight and quadrupled by doubling its speed. Since brake heat energy is only related to the amount of kinetic energy being converted, it doesn't matter whether the brakes are applied hard for a short time or light for a long time, the resulting heat will be the same if the desired speed reduction is the same. If all the brakes on a vehicle are generating the same amount of brake torque, the heat created by converting kinetic energy will be evenly distributed through all the brakes. However, imbalance caused by poor maintenance, poor load distribution, or light brake applications may cause an uneven distribution of brake heat with some brakes possibly overheating. The typical generic "normal driving" temperature range for well balanced vehicle brakes is 100 to 200 degrees. A controlled mountain grade descent can produce brake temperatures between 200 and 400 degrees. Carlisle reports that a brake resin odor is produced at about 550 degrees and visible smoke is produced at 850 degrees. Brake system heat is dissipated through radiation, conduction, and convection due to a temperature gradient. Radiation is the transfer of heat through space. Conduction is the transfer of heat to parts of the brake system and other attached vehicle parts. Convection is the transfer of heat from the brake to the air moving across the brake. As a result of the limits on how quickly heat energy can be dissipated through radiation, conduction, and convection, a brake system can sometimes build up heat faster than it can be removed. This imbalance between the heat coming into the system and the heat leaving the system is referred to as saturation. If this imbalance persists and the system's heat builds up to certain temperature thresholds, then brake fade can occur. The temperature thresholds for brake fade vary depending on the brake system and the category of the fade experienced. Brake fade can be broken down into four main categories including: friction fade, mechanical fade, fluid fade, and domino fade. As previously discussed, friction is the mechanism used to convert kinetic energy into heat in a brake system. Friction is the resistance of motion between two objects that are in contact with each other. If friction at the friction surface is reduced to an unacceptable level, the ability to convert kinetic energy into heat will also be reduced. When a reduction in the friction at the friction surface occurs as the result of heat it is called Friction Fade. When friction fade occurs in a hydraulic brake system, the pedal will still feel hard to the driver, but he will notice a difference in the braking response of the vehicle. For air-braked vehicles, when friction fade occurs, the driver may report the pedal going to the floor. Brake friction is affected by the temperature at the friction surface. The heat/friction profile is different from lining to lining and can be linear or curvilinear. Either brake lining friction can gradually decline (linear) as heat builds in the brake, or alternatively, lining friction can build-up until it reaches a peak, then quickly begins to decrease (curvilinear). Generally a linear heat friction relationship is more desirable because its fade is gradual and predictable. Brake linings are made of many different types of materials that are bound together with resins ("glue") during production. These resins are often blamed for reducing the friction at the friction surface. A commonly disputed claim is that "gaseous bearing fade" occurs when the resin gasses escaping from an overheated lining create a layer of gas at the friction surface. This layer of gas is blamed for reducing the friction at the brake's friction surface much like a layer of water reduces the friction between a tire and the road during hydroplaning. Gaseous bearing fade is also often associated with the propensity of fade experienced within new brake linings (Green Fade). New linings are believed to produce a greater amount of resin gasses and, during normal driving, new linings do produce an odor that is associated with these escaping resin gasses. Gaseous bearing fade is also commonly claimed to be associated with melting metal and friction material creating this lubricating gas. Opponents to these claims believe that these gases cannot be produced at a rate that can keep up with the speed of the spinning brake and do not believe gaseous bearing fade to be a true cause of brake fade. Resins can also reduce the friction at the friction surface when the brake linings become glazed. Glazed brake linings can contribute to cause brake fade, particularly domino fade. Reports are that glazing of a brake lining occurs when the resins in the lining are "melted" and reharden to form a hard "crust" on the surface of the lining usually due to short braking cycles. This hard surface on the lining reduces friction at the brake's friction surface. Glazed linings are easily identified by an abnormally shiny surface. To prevent fade and glazing, brake drums and rotors are often drilled or slotted. Early hot-rodders started drilling brakes because of their belief in gaseous bearing fade. Even today drilled and slotted brake rotors are still commonly seen in performance applications, including production motorcycles and sports cars. Probably, there is no dispute about the effectiveness of drilled or slotted brakes in reducing fade and glazing. However, it is also reported that drilling and slotting brakes reduce fade and glazing both by pumping or fanning air across the friction surface to keep it cool and by abrading the lining friction surface to keep it from glazing. Incomplete friction surface contact is also a contributing cause of friction fade. A brake's friction surface that has incomplete contact will not distribute the heat evenly across the friction surface and the portions of the friction surface that are in contact will get hotter than they normally would. Brakes in this condition are easily heated up to the point of friction fade. Evidence of brakes that fail due to incomplete friction surface contact is seen as localized discoloration (i.e. bluing) of the metal friction surface. Bent or misaligned brake backing plates or Spiders. Bent or twisted brake shoes. Common to "remanufactured" shoes. Reusing brake drums or rotors without resurfacing them. Uneven surface pressure distribution on green linings. More common on cheap imported linings. These irregularities commonly cause brakes on big trucks to catch fire soon after being replaced. These irregularities are also more likely the cause of the previously discussed green fade. Green linings reportedly do not distribute application pressure evenly across the friction surface until they are burnished. I have seen vehicles that experienced green fade within a few miles of having both their rotors and linings replaced. These cheap imported brakes sometimes show evidence of localized overheating (1000 + degrees) from only a few stops! Brake rotor and drum thickness is also an element of friction fade. If the drum or rotor is excessively thin, its ability to store heat will be reduced. This also can cause the friction surfaces to get hotter than they would under the same circumstances. Brakes with excessively thin drums and/or rotors can easily heat up to the point of friction fade. Additionally, insufficient drum thickness can cause heat expansion of the drum to be excessive. These effects on brake fade are discussed in the following section. Mechanical Fade is most commonly associated with drum brakes and not disc brakes. In a drum brake, the application of the lining is outward toward the rotating drum's friction surface. As the brake drum heats up, it expands outward. This expansion will increase the drum's diameter, moving it away from the lining application. The expansion of the brake drum causes a need for increased lining travel and increased travel of the application device. If expansion is great enough, it can cause the application device to bottom out and the brakes to fail. A disc brake lining application is at a right angle to the rotating disc and expansion of the disc is outward toward the application rather than away from it. For this reason disc brakes have better fade resistance. Brake drum expansion is probably the most concerning aspect of brake fade in S-cam braked heavy trucks. In an S-cam brake, the application device is the brake chamber. A typical brake chamber has a maximum pushrod stroke capability of about 2.5 inches. Cold pushrod stroke measurements on a truck with Automatic Brake Adjusters (ABA's) are commonly found to be around 1.75 inches. So, a typical brake chamber will have a reserve stroke of around 0.75 inches. As a brake drum expands away from the brake linings, the cold pushrod stroke will increase. A brake drum temperature of 400 degrees can increase pushrod stroke by as much as 0.5 inches. The force output of a brake chamber is not linear, and a typical brake chamber reaches its knee point where force will begin to drop at about 1.75 inches. If the brake drum becomes hot enough, the brake chamber can bottom out and the brake chamber force output at that point will be 0. Drum brakes are also very susceptible to brake fade because they are self-energizing. In a self-energizing brake, when the lining is applied to the drum, the drum rotation tries to pull the lining and shoe along with it. This self-energizing action increases the force applied to the lining friction surface. When fade reduces friction at the friction surface in a self-energizing brake, a compounded reduction in applied force at the friction surface results in a compounded reduction in braking. The two common types of self-energizing drum brakes used in automotive applications are the Leading-Trailing drum brake and Duo-Servo drum brake. The Leading-Trailing drum brake has a fixed anchor on one side of the shoes. The Duo-Servo drum brake has "floating" anchorage. In a Leading-Trailing brake, only the leading shoe is self-energized. In a Duo-Servo brake, both shoes are self-energized. Therefore, a Duo-Servo drum brake can have a greater reduction in applied force at the friction surface than a Leading-Trailing drum brake and is more susceptible to fade. Cars and trucks from Class 1 to Class 6 commonly use a hydraulic brake systems. A hydraulic brake system works by using a non compressible fluid (brake fluid) to transmit the force of a driver pushing on the brake pedal to the brake linings. Air and vaporized fluid are compressible and, if allowed into a hydraulic brake system, the brake pedal will feel spongy and the force transmitted to the lining will be reduced. Just like water, brake fluid can boil and change to a vapor if it gets hot enough. Fluid Fade is the overheating of brake fluid causing it to vaporize. The vaporized fluid will have to be compressed before the system can transmit pedal force to the lining. In most cases, there will be insufficient pedal travel to do both. The brake fluid used in cars and trucks typically has a boiling point of around 401degrees at sea level. Brake fluid is also hygroscopic, a characteristic which allows it to absorb moisture. Over time, brake fluid will become contaminated with moisture. As this happens, the boiling point of the brake fluid will be lowered, since the boiling point of water at sea level is only 212 degrees. 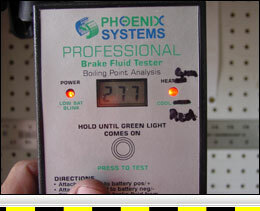 Wet brake fluid has only a 3.5% water content and the wet boiling point of brake fluid drops to 284 degrees. I have tested the boiling point of brake fluid many times and have tested samples that boiled at temperatures as low as 260 degrees. For this reason, brake fluid maintenance recommendations are that it should be flushed about every 4 years. The boiling point of a fluid is also reduced as altitude is increased. For example, the boiling point of water is reduced by approximately 1% for every 1,000 feet above sea level. So driving mountain passes, which often exceed 11,000 feet, driving Pikes Peak highway that tops out at 14,110 feet, or Mount Evans Road, that tops out at 14,130 feet can easily cause brake fade, by producing a significant drop in the brake fluid boiling point. These locations also put extreme demands on a brake system that cause brakes to get hot and are the most common places brake fade is experienced. Domino Fade occurs when some brakes in the system have more brake torque than the others. This imbalance may be the result of poor maintenance, poor load distribution, or light brake applications. The brakes producing more torque will heat up much quicker than they should, which could cause them to fade. If the high torque brakes fail, the other brakes will then receive a disproportionate amount of heat. These now overloaded brakes will also likely fail, hence the domino effect. Domino fade is a characteristic that is common in heavy trucks that often have imbalances between the tractor and trailer's brakes. Light, steady brake applications may not activate all the brakes on a heavy truck. Hard, short brake applications promote more even braking and better distribute heat throughout the brake system. 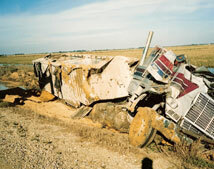 For this reason, it is recommended in the CDL manual that truck drivers use the snub braking technique when operating on steep grades.